The USBG is one of the best things I have done in my professional career. Meetings, education, competitions, a nationwide brotherhood of like minded bartenders who are just as passionate about this industry as I am. I will always be a member of the USBG and will continue to encourage bartenders( esp "urban market" bartenders who aren't exposed to this part of the industry as much) to join and become active members of the family. 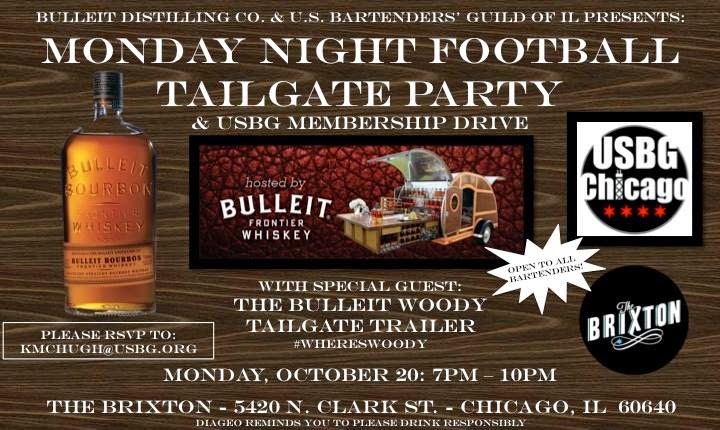 So with that being said, tonight, the USBG-IL chapter is hosting a tailgate party and membership drive. 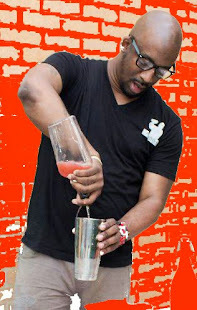 So if you haven't joined, or are interested in learning more, join myself and the rest of the Chicago family( well those of us who didnt make it to Portland for cocktail week) at The Brixton tonight from 7-10pm. Well everyone, Its that time again! Speed Rack Season 3 is ending this Sunday here in Chicago!! If you have never been to Speed Rack, I'll give you a quick breakdown. Speed Rack is in its 3rd year. 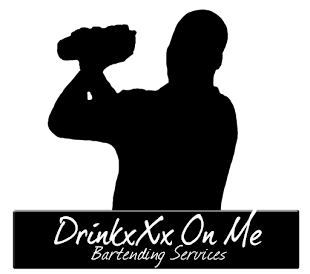 It was started in February of 2011 by bartenders Ivy Mix and Lynette Marrero. The competition focused on the women of our industry, celebrate them, and raise money for Breast cancer research. I have been to speed rack every year it has been here in Chicago, and even had the opportunity to go to Speed Rack, on my 1st trip to Portland for cocktail week in 2011. So Imagine 8 of the best female bartenders in Chicago, on stage, duking it out, all while you are cheering them on, and enjoying punch, cocktails and food from some of the great sponsors. AND you ll be drinking and eating for a great cause!! My family has been affected by Breast cancer, and other types of cancer, so I will ALWAYS support anything and anyone who is supporting finding a cure for this horrible disease. And you can donate at the door as well for $25. Remember all proceeds go toward breast cancer research. So be there!! I will be!!! You can find Mr.Mixologist aka the " Boobie Bandit" running around on the floor all day Sunday! Hey hey everyone! You know I have been neglecting the blog, but I've been SO busy lately, and have many things to share with you from the last month or so, and lots of new and exciting adventures upcoming! Today we will review a new AMAZING spirit, Kappa Pisco. So if you been following the blog here, you already know what Pisco is. If not, Pisco is a colorless grape brandy that is made in the wine region of Peru and Chile. A great spirit, most notably known for its greatest creations, The Pisco Sour, and Pisco Punch. Although there are MANY different ways to enjoy the spirit, those are the best 2 ways, in my opinion, to introduce someone to Pisco. Which brings us to today's subject, Kappa Pisco. Kappa is the newest expression from the Marnier Lapostalle family. The same family that's produces Grand Marnier, and the Lapostalle Wines of Chile, and wines from the Loire Valley. So when i say expect a QUALITY product, this will be one! Kappa is made with 2 different Muscot grapes, the Alexandria and Rose. In my experience in tasting and playing around with Kappa, I get hints of Spice, Vanilla, and of course grape when i taste. No burn, and very smooth. Kappa recently got a 92 at the Ultimate Beverage challenge AND won the Chairman's Trophy at the UBC as well. So when I say this is a quality spirit, it has the credentials to back up my claim. Today I am happy to talk about a product that I truly enjoy working with. Alot of time, I make my own syrups, cordials, etc, But a couple good friends of mine have a product line that I really enjoy using in my cocktails. 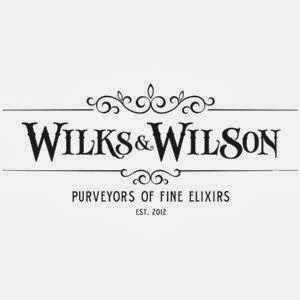 Wilks & Wilson( Greg Wilson and Zachary Wilks) produce hand crafted, organic, and mostly natural elixirs that were intended for use in Non alcoholic beverages, but they are delicious in some of the classic cocktails of yesteryear. Now the interesting story about how I came to meet these guys is interesting. 2 years ago while I was in New Orleans for Tales of The Cocktail, Some friends and I were throwing around the idea of creating a product. Bitters, Syrups, and even a carbonated cocktail came into play. So someone close to me said, "hey you should meet this guy down here named Greg, who has a line of syrups. Its looks pretty cool." So thru the magical power of twitter( its great when used correctly) we tracked each other down and when I found Greg Wilson, I planned on just talking but he handed me a 6 pack of his product and his card and said please stay in touch. So after getting home and unpacking a whole suitcase full of booze(don't ask, just come to TOTC and you'll find out) I took a look at this product.. What struck me 1st was the pictures on the labels and the wide variety of flavors and distinctions between them. Needless to say I was intrigued. So fast forward to this past Tales of the Cocktail and not only did I run back into Greg, but I got to meet Zachary Wilks as well. Great guys with a Great product that I can stand behind and use when taking care of my events. Now that you got some background, lets get to the meat of the story, the product!!! Now some of the best cocktails in the country are being made with Wilks and Wilson as it is available in Chicago, Indiana, St. Louis, Michigan, Massachusetts, and Kansas City most notably. As stated earlier my favorite cocktail to make with their product is the "DrinkxXx On Me Mojito" using the Lime Mint Simple.. So why not share it with all of you.. I debuted it last year at a guest bartending shift I had. It has since become a staple. A different take on the Mojito recipe.. Took some time off from working and writing, but I would like to say Happy New Year from DrinkxXx On Me!!! So I have some goals for myself in thus new year and one is to bring you all a blog post every day, starting today. Whether its Lifestyle, drink reviews, spirit reviews, some of my adventures in this crazy hospitality that I work in, or just if I want to shoot the Sh*t with all of my readers, you will all get something alcohol related from me. So GET READY!! But with that being said, its been a hectic couple weeks in 2014 so far ni the liquor world. 2 BIG acquisitions happened in the first 14 days of 2014. Japan's Suntory ( which boasted the likes of Bowmore scotch and Yamazaki Japanese Whiskey) now has acquired Beam, Inc for a whopping price of $13.6 Billion dollars. Now nothing says America more than some good ol bourbon but now, 2 of the most recognizable names in whiskey, Jim Beam and Makers Mark will belong to a Japanese owner. Along with those brands, in this deal, Suntory will have, most notably Courvoisier, Laphroaig, and Knob Creek. So its been some big moves made in the spirits biz to start the year off.. Cant wait to see what the rest of 2014 brings!! See you tomorrow with a product review of Wilks and Wilson, LLC.. 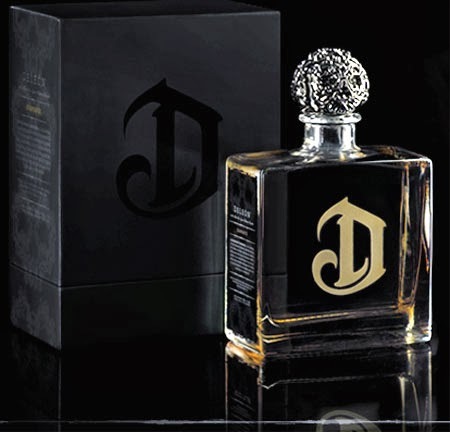 This gift set includes 3 bottles (750ml) of Illegal Mezcal Joven, a 3 liter barrel, Barrel Aging instructions and a cocktail booklet. 2. Cocktail Books! Who doesn't love a great read on these cold winter nights. While there are many many worthy publications, the one that stands out this season is one of the new kids on the block, " Apothecary Cocktails- Restorative Drinks from Yesterday and Today" by Author, and good friend of mine Warren Bobrow. This cocktail book features 75 traditional and newly created cocktail recipes that are medicinally themed. 3. What bartender doesn't love new shiny things?? Be sure to check out Cocktail Kingdom for all your favorite bartenders new tools, toys, and gadgets!! My personal favorites, the Yarai Mixing Glass, the Copper collection, the silver collection, and the wide array of bitters bottles. 4. The GEAR!!! We all like to look nice, especially behind the bar looking approachable and neat is a must. And the Chef wear brand keeps myself and hundreds of my counterparts looking mighty dapper. If you act now, they are doing free shipping for a limited time..
5. AND the one thing that you can always get your favorite bartender for the holidays, "drum roll"...... SPIRITS!!!! Its a wide array of tasty spirits for that bartender that you love, but for some of us who are whiskey lovers, I was doing a little research and found a gem of a Japanese whiskey that just hit the states. Hakushu Heavily Peated is now available, and is different from the Hakushu 12 year that has been available for awhile now. After reading the review on Men's Journal, this seems like it will be on the wish list of Scotch whiskey lovers all over! So hopefully these tips will help you find something for the drink slinger in your life, and if not maybe you found something for yourself!! Be sure to watch our posts starting tomorrow where the " 12 days of Christmas" cocktail series will start. This will be a fun Boozy time!!! Combine all Ingredients in a shaker, shake hard and strain into a chilled cocktial glass.